It’s all about value for money in the platform industry and fee pressure is unlikely to abate. But how do you make sure you’re monitoring the market effectively? The Sandbox allows platforms to analyse their fees against those of their competitors and across different wealth bands, adapt to changing fee and competitor pricing trends, and act to stay ahead of their peers and gain a competitive advantage. The Sandbox is a unique pricing analysis tool that will help you stay ahead of their peers and gain a competitive pricing advantage by tracking and adapting to changing fee trends more quickly. Intuitive and easy to use, the sandbox replicates your current fee model in each scenario ready for you to adjust and tweak as necessary. Transfer your new pricing strategy to Comparetheplatform calculator with a few straightforward clicks. Use the Sandbox as a permanent tool in your competitor intelligence toolkit or subscribe for three months at a time during pricing strategy reviews. Running detailed, accurate spreadsheets that analyse competitors’ pricing strategies is time-consuming and costly to manage and maintain. By using Comparetheplatform’s premium Sandbox functionality, your analysts will be free to focus on pricing strategy rather than wasting valuable time collating and maintaining competitors’ pricing data. The Sandbox allows platforms to add up to 10 scenarios and provides immediate rankings for pre-defined portfolios (£100K, £500K, £1m and £5m) or run a bespoke portfolio. Platforms can also choose how they’re ranked against a particular competitor. We have used the latest encryption standards to ensure that your commercially sensitive data is not visible to other platforms or the Comparetheplatform team. Advanced Encryption Standard (AES) is used to encrypt platform data using a secret key and data is stored and backed up in its encrypted format. In addition, encrypted data can only be accessed by authorised users. The decryption method uses the same secret key. 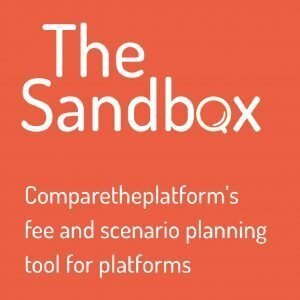 Add the Sandbox permanently to your toolkit for £7,500 per year for up to five users. For periodic reviews of your pricing strategy, the Sandbox can be accessed in blocks of three months at a cost of £3,000 per quarter. To find out more, download our Sandbox presentation below. To place an order, download the order form, fill in, scan and return to us by email.